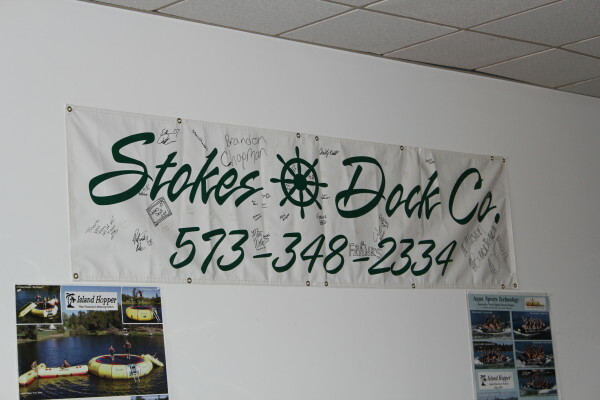 About Stokes Dock Co., Inc.
Stokes Dock Co. has been in business for 6 years. We construct commercial docks and custom-built residential docks. We also have dock repair w/ a 24-hour emergency service. We have recently expanded our business to offer all dock accessories. Post bumpers, heavy-duty rubrail, harbor cushions, Ryan-O dock rollers, Firstmate Remote Control systems, Dockwatcher camera systems, dock closet kits, Aerolators, Permafloat encapsulated foam, Polylift boatlifts and all dock hardware accessories. Our new office is located in the Stone Crest Mall to better serve all clients at Lake of the Ozarks. We are also expanding our operations to include kit docks for the do-it-yourself customers. We also offer CAD layouts to help clients configure a dock that not only fits their needs, but fits to Ameren UE property codes.